eNews February 23, 2018: FREE Screening Series Starts Tomorrow! 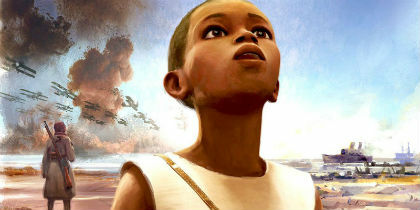 If you missed the news amidst the hubbub of SPARK FX, we’re excited to remind you that the French Touch screening series kicks off tomorrow at 12PM with Adama, Simon Rouby’s film which tells the story of a 12-year-old boy who disobeys his father and follows his older brother, ending up on a troop ship to France during World War I. Produced in partnership with the VIFF Vancity Theatre in collaboration with the Institut français and the Consulate General of France in Vancouver, we will be presenting a free monthly screening celebrating French animation. The screening is FREE and open to all ages and though you’re welcome to just drop in, we highly recommend securing your seat in advance by visiting the Vancity Theatre website. © 2018 Marvel Studios. All Rights Reserved. A trademark of recent superhero films is, of course, the main character’s super suit. Oftentimes, owing to complex stunts and some costume re-designs, the final suits are often digitally enhanced or augmented, or occasionally fully computer-generated. In the case of Ryan Coogler’s Black Panther, the title character’s distinctive Wakandian and vibranium-ladden wardrobe was predominantly CG. 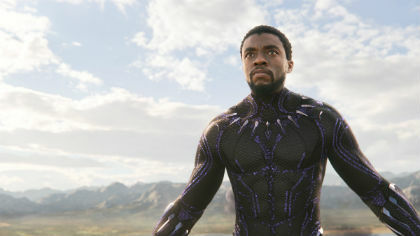 Actor Chadwick Boseman and various stunt performers wore versions of the suit during principal photography, but the many visual effects vendors on the film shared a digital Black Panther suit asset to complete final shots. Leading the effort on the Black Panther suit asset, and that of his adversary, Killmonger (Michael B. Jordan), was Method Studios. Method Studios visual effects supervisors Todd Sheridan Perry and Andy Brown run down the challenges of realizing the sleek costumes, and other costumes the studio built while creating several digital doubles for the film. To get the Black Panther suit into the CG realm, costume designer Ruth E. Carter’s Black Panther and Killmonger creations were scanned by Clear Angle, which also carried out scans of just about every actor in costume on the film. Photogrammetry sessions and texture shoots were also undertaken. 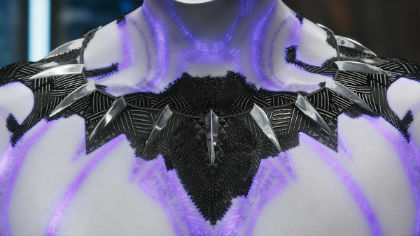 The Black Panther suit, in particular, was patterned with many tiny triangles and Wakandan font throughout it that needed to be replicated in the digital version. Still, Method Studios says it was extremely helpful having the actors and stunt performers wearing practical suits on set. “Having the actors in the suits was fantastic because we had lighting reference for what it should look like and that helped to get the suit into the scene so that the lighting felt the same as the rest of the practical photography,” says Perry. Read the rest of Ian Failes’ interview with Todd Sheridan Perry and Andy Brown at our website.